The Meshback Track Kit from Lithonia Lighting provides an attractive solution for adjustable accent and task lighting. Lithonia Lighting Track portfolio combines clean, attractive aesthetics with superior functionality and savings. This designer-approved style takes the guesswork out of the equation, allowing the decor characteristics and functionality to be the focal point of the space. 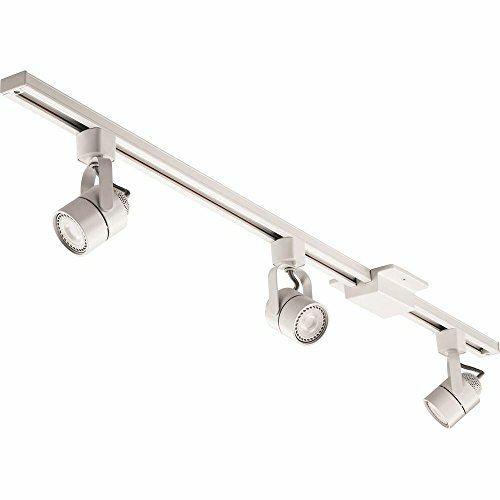 This Meshback track kit offers classic design with the maintenance-free and energy saving benefits of innovative LED technology. • Uses energy efficient LED lights, lasting upwards of 25,000 hours. • Fully dimmable with compatible dimmer switches to create the perfect atmosphere. • Energy efficient LEDs to reduce your electricity bill and save money. • Adjustable track head rotates 350-degrees and has a 60-degree tilt so you can aim exactly where you need it. • ETL listed to US and Canadian safety standards and dry location listed. • Easily mounts to ceilings and can be quickly hardwired using included instruction manual. Specification: • Size: 3 pre-installed track head. • Dimmable: With compatible dimmers. • Watts: 4.5w per light bulb, 13.5 watts total. • Dimensions: 44.5 x 2.2 x 6.4 inches. • Kit includes (1) 4’ track (120V), (1) floating feed, (3) MR16GU10 LED Lamps and (3) adjustable track heads. The fixed track series combines aesthetics with superior functionality for applications such as specialty retail, grocery, galleries, museums, hospitality, residential and educational environments. .
3-year limited warranty. Complete warranty terms located at http://www.acuitybrands.com/resources/terms-and-conditions. STYLISH DESIGN - Stylish track head is suitable for specialty retail, grocery, galleries, museums, hospitality, residential and educational environments.